In 2009 my house was broken into while I was living in West Nashville. This caused me to do two things in quick succession. First, I adopted a huge Irish Wolfhound mix named “Apple,” and secondly, I bought a handgun. Now, since I tend to dive headfirst into anything that I get myself into… I began to research handguns, and that inexorably led me to the EDC community. I think that everyone has a story about their relationship to carrying a pocket knife. Mine is wrapped up in EDC videos on YouTube, and hours spent scouring BladeForums threads. 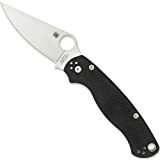 One of the knives that struck a chord for me, and has endured since the very first years of my collecting, has been the Spyderco Paramilitary 2. Now, my handedness (being left handed) has limited me in several areas when it comes to knives, and it ultimately forced me into buying primarily custom knives that I could have made for me. Whenever I see a company offer a production knife in, specifically, a lefty configuration I always try to buy at least one to support that effort they went to. The Left Handed version of the PM2 (model number C81GPLE2) was a no brainer for me. After all, this is arguably Spyderco‘s most popular knife. Editors note: It is worth noting that the only difference between this left handed version of the Para 2 and the original PM2 is that the locking liner side and non locking liner side have been swapped. This lefty version is literally a mirrored version of the original Paramilitary 2. I can’t help but think of my days studying biology when I consider the Lefty Para 2. It’s the same concept of chirality that they teach in the introductory organic chemistry course. The Paramilitary 2 Left Handed has an overall length of 8.3″, a 3.4″ blade, weighs 3.75 ounces. Just like the original Paramilitary 2, this left hand version is made in the U.S.A. out of Spyderco’s Golden, Colorado factory. The thing that DOES stick out about the PM2 blade, and is worth talking about, is how universally great it is. The leaf blade shape that Spyderco has championed for years is one of the more useful blade shapes out there. This, paired with their full flat grind on S30V steel gives you a strong but surgical tip for delicate operations, and long sweeping primary cutting edge. Now, I’ve used this blade for a LOT; opening packages, slicing apples, I even chopped up a cream filled cronut the other day. The Paramilitary 2 is a versatile and capable blade that will carry out day to day tasks, from the campsite to the kitchen without hesitation. As a footnote, I’m not gonna go in depth about S30V. It’s a knife-specific allow that was developed by Chris Reeve and Crucible for folding pocket knives. At this point, we should all be at least a little familiar with it, it performs well, it’s very stainless, and it’s at least reasonable to sharpen. They make PM2’s in a variety of steels these days, but not the left handed version… and I’m not a steel snob, pretty much anything from VG10 nicer is okay for me, as subjective as that might be. The Paramilitary 2, true to it’s name, was designed for LEO and Military use. Now… in reality that most likely means that it’s 99% bought and used by people like you and I, and 1% make it into the gloved hands of actual military users. But it’s intended purpose did inform some of it’s design decisions. The handle is slightly oversized with a pronounced shape to seat and lock your hand in place. There’s an alternate grip position with the knife open and your index finger inside the front choil that would allow you to “choke-up” on the knife for finer control. The handle slabs are peel ply black G10. That is very grippy. It’s not shred-your-jeans-grippy, but grippy all the same. Last big detail that is instantly apparent when you hold the knife is the thumb ramp. It’s steep, and it’s jimped. This serves as just another step in locking the knife into your grip when you hold it. The pocket clip is one of Spyderco’s typical “spoon” pocket clips. Not a lot to say here except that they are functional and nicely designed. Tension is perfect and the knife carries well. There are a few other people that make deep carry clips for the PM2, so if you wanted another option you could find that there. In keeping with the Spyderco trend, the PM2 utilizes a “spydie-hole” opening method. This is a distinguishing feature of the Spyderco line of knives. This is basically a .5” diameter hole in the blade that serves as the opening method. It’s something that Spyderco has been doing for a long time, a lot of you are likely familiar with it so I won’t belabor that particular point. Well… the Paramilitary 2 is my go to knife when people ask for a recommendation for what knife they should buy. I love the size, I love the grind, and I love the steel. Priced around ~$100 it packs a TON of pound per pound capability. The blade will preform equally well in the kitchen as it would on a construction site. The handles are comfortable to hold, and will stay grippy in almost any conditions. Lastly, the lock is one of the most solid out there, easy to disengage, and simple to operate. Before I completely button up this review, I think I need to address the backwards elephant in the room. Spyderco released one of the most successful models in a left handed version, and it occurred to me (and my editor Dan), that I should touch on that fact. I think the best way to describe this would be the following: My experience with the Lefty PM2 is likely exactly the same as the right-handed world’s experience with the original PM2. Now, this is worth spending some time considering, the PM2 has a 4-way placeable clip, so most southpaws carried it lefty and just operated the lock the best that we could. The compression lock when operated with the opposite hand that it was designed for is awkward, incredibly, and can be borderline dangerous. Spyderco fixed that problem for us. As I stated earlier, whenever a company released a left-hand specific I typically buy it to support that gesture. This is a great example of that. I recommend purchasing the Paramilitary 2 at Amazon or BladeHQ. Purchasing anything through any of the links on this site helps support BladeReviews, and keep this review train running. As always, any and all support is greatly appreciated. Great review! Even as a righty I appreciate Spyderco doing this. I’d note that the blade markings are also reversed. They could’ve just phoned it in on that and they didn’t and that’s a nice touch to me. I want to say thank you for the review. I had a right handed version a few years ago but dumped it for a few reasons one of which was I carry and use this size knife on my left side and use it left handed. I typically only use flippers or lockbacks for this reason. I just ordered the left handed Paramilitary 2 thanks to your review. I kind of feel bad for lefties that want the other steels/colors (and even the sprint runs). Hopefully, it doesn’t take too much to make the left-handed version, and you’ll see your favorite PM2/PM3’s in left-handed versions.